Ever dreamed of waking up to the sound of waves crashing on the Great Barrier Reef? Or lounging on a tropical beach almost all to yourself? Or enjoying a family dinner with cocktails on a beachfront cafe? A trip to Fitzroy Island will ensure that you get to do all these, and more. The Fitzroy Island is no less than a paradise on the Coral sea. Located on the Great Barrier Reef, this unspoilt tropical paradise abounds in marine life, local wildlife and spectacular beaches and walking trails. I was fortunate to spend 2 days in this idyllic destination and I loved every minute of my stay in the beautiful island resort. Located 45 minutes from Cairns in Tropical North Queensland, Australia, Fitzroy Island is easily reached by regular ferry transfers. You can hop aboard the Fitzroy Island Resort ferry from the Cairns Reef Fleet Terminal Marina. The 45 minutes long ferry ride, that passes along inhabited islands and rain forest is worth the time and money. Once we reached the island, we were greeted by the hotel staff and handed the Fitzroy Island map, that came handy while exploring this 339-hectare continental island. With towering rain-forest mountains, a lighthouse, fringing tropical reefs, a turtle rehabilitation center, virgin beaches, along with several dining options, this island resort has a lot to offer. As we were travelling with our 3-year-old, the first thing we did after checking in was to hit the beach. The island beaches are made of coral rocks and are not quite comfortable to walk around, so make sure you wear shoes. We could hear a clinging sound when the waves hit the coral rocks on the shore, I thought the sound was quite musical. We spotted colourful fishes and turtles while snorkeling. The corals around the islands are mostly white and off-white in colour, but if you dive into the deep sea, you might be lucky enough to spot colourful corals and sea cucumber. It’s always advisable to wear sting suits as Jellyfish can be rampant depending on the time of the year. If you do wish to explore the deep underwater world, there are shops on the beach itself where you can rent water sports equipment and special diving trainers. Nudey Beach – Don’t go by the name! On Day 2, after breakfast, we headed over to explore Nudey Beach on the other side of the island. Do not go by the name though, keep your clothes on! A 25-mins trek through bushes and rain forest brings you to this secluded beach. We trekked with our 3-year-old and it wasn’t as tough as we thought it would be. I loved lazying around the Nudey beach and getting clicked, the place is too beautiful for not being photographed for memories. This is a sandy beach in which one can snorkel and swim too unlike the other beaches on the island, at low tide one can get an easy view of the corals too. If you happen to have a day tour, I would recommend that one should venture the Nudey beach instead of going to other beaches on the island, totally secluded and you have a whole private beach to yourself and your family, isn’t it amazing? Next, my little one was extremely excited to see the Turtle Rehabilitation Centre, where injured and old turtles are housed. I must admit that we loved it as much as she did. There are 2 tours that runs through the day and the cost of the tours are like 8.5AUD/person and 5AUD/Child and the kids totally love this place, so did we. The Fitzroy Island has another little island located adjacent to it, that houses a small lighthouse. There isn’t much else on this baby island and the only way to get to it is to swim. Also, worth a visit – if your kid can trek the 30-40 mins – is the Secret Garden, a beautiful garden with wild flowers. 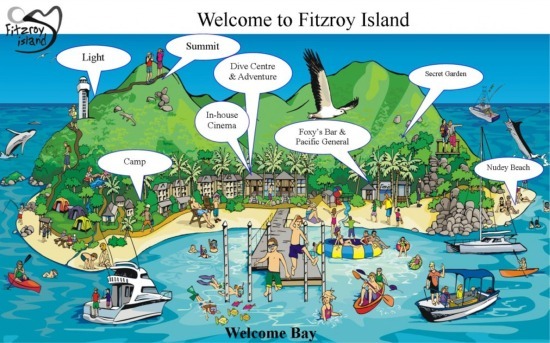 Fitzroy Island Resort is the only resort on the island. It offers several types and sizes of rooms – a total of 99 rooms – ranging from a 32 sqm Studio to a 120 sqm 2-Bedroom Cottage. The facilities, which include a resort pool, spa, general store, in-room and poolside massage services, a movie theatre, games room, table tennis and kids’ playroom, are only available to hotel guests. For your dining needs, the resort has a restaurant and a pool-bar on site. After our water activity on day 1, we headed to Foxy’s Bar, which is situated right on the beachfront. Foxy’s has an excellent casual cafe style food menu including kids’ meals and provides a wide range of beers, wines and cocktails. The bar pool has a kids’ section too, so while you enjoy the island cocktails, your children can enjoy their own splash time. Day 2 on the Island started with a sumptuous breakfast next to the beach. Their hot breakfast is a must-have, and at 22 AUD/person, it is worth every penny, especially since it comes with a view! Besides the daily buffet breakfast, Zephyr Restaurant also offers a modern Australian a-la-carte menu, using locally sourced ingredients, with nightly specials available. On some nights a seasonal buffet may be as offered as an alternative to the a-la-carte menu. As it was time to catch the last ferry of the day, we set sail back to Cairns city, bidding adieu to this paradise, as we watched the sunset while relaxing on the deck with our evening cocktails. I still feel 2 days is quite short to enjoy this tropical paradise on the Great Barrier Reef, but I surely look forward revisiting this island once again very soon. Former Mrs. Asia International 2015, Debasree has several roles and titles under her belt. After being in the corporate world for a decade, Debasree decided to settle in Melbourne and follow her passion for fashion, runway and travel. Debasree is also a Digital Marketing Strategist, Social Media Influencer, AFL (Australian Football League) Community Ambassador, Cricket Australia Community Ambassador, Women of Wyndham (WOW) Ambassador, and a Fashion and Travel Blogger.